Benefits of Onion For Weight Loss – How It Helps? What Are The Health Benefits of Onion? How To Avoid Cons Of Eating Onions? Why To Avoid Sprouted Onions? How To Stop Crying While Chopping Onions? How To Get Rid Of Onion Smell From Hands? Onions are rich in quercetin, a flavonoid that prevents fat accumulation and also boosts metabolism. They are highly effective in promoting weight loss. So, if you are serious about losing weight, include onion in your daily diet; But you should also know how to use it for weight loss. 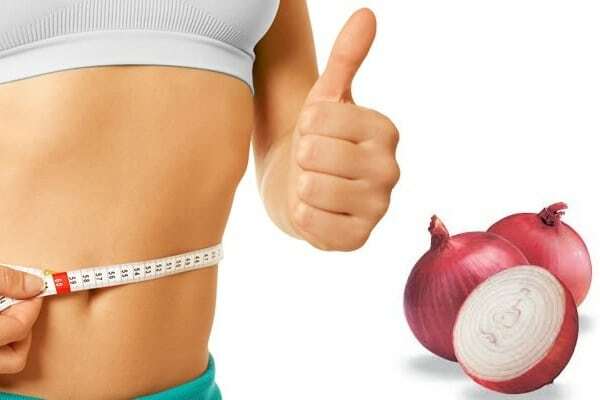 In this article, you will learn 3 best ways to use onion for weight loss; benefits of onions, and how to tackle the after effects of eating onions. Let’s begin. Drinking onion juice is the best way to lose weight. Frying it can destroy the nutrients and therefore to reap all the health benefits of onion; drink onion juice. Here’s the best way to prepare onion juice for weight loss. 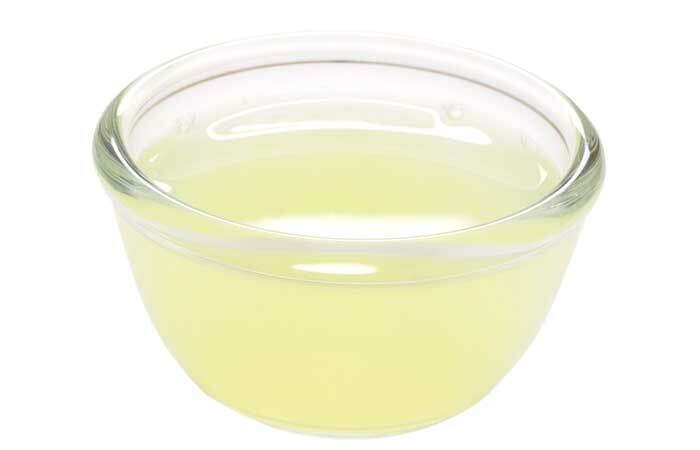 How To Prepare Onion Juice For Weight Loss? Remove the skin of the onion and slice it. Add a cup of water to a saucepan and bring it to a boil. After 4 minutes, remove it from flame and transfer it to a blender. Blend it well and add two more cups of water. Pour the onion juice into a glass and drink it. Soups are incredible when it comes to aiding weight loss. They fill you up and are loaded with nutrition. You can have it for lunch or dinner. 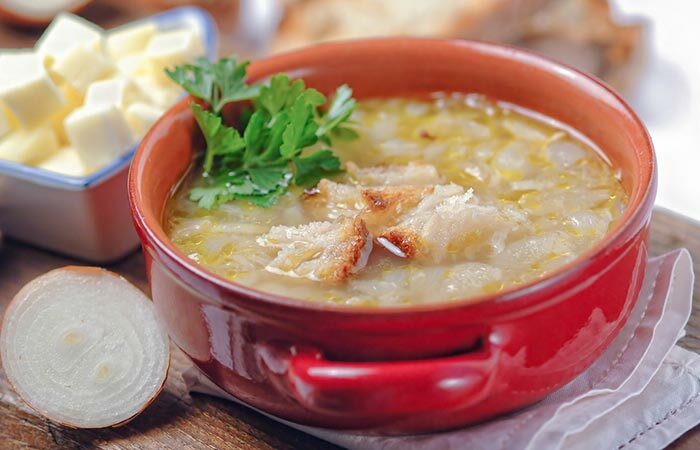 Now, here’s a great way to prepare onion soup that tastes amazing and will help you lose weight quickly. Add olive oil to a soup pot. Then Add the ginger and garlic and saute for 2 minutes. Add the onions and veggies. Stir and cook for 30 seconds. Now, add the vegetable or chicken stock. Add black pepper and salt. Stir and cover. Cook for 10-15 minutes. Transfer the soup to a bowl and garnish it with cilantro. No surprise that if boiled onions can be so healthy, raw onions are the best. The phytonutrients in the onion don’t undergo heat-induced degradation. So, you will be able to get the best of the nutrients present in onion which will help you lose weight effectively. Here’s how we recommend you eat raw onion for weight loss. How To Eat Raw Onion For Weight Loss? Toss the sliced raw onion into a bowl. Squeeze the juice of lime on the onion slices. Sprinkle a little pink Himalayan salt. Eat it as a side for lunch or dinner. So, these were the 3 best ways to consume onion for fat loss. Now, here are few more onion recipes for weight loss that will keep you coming back for more! Take a look. Pomegranate onions are delicious and can be enjoyed with non-vegetarian or vegetarian food. It includes ingredients that promote weight loss and this recipe is super easy to make. Here’s the recipe. How To Prepare Pomegranate Onions For Weight Loss? Toss the onions in olive oil and skewer them. Place them on a griller. In a bowl, mix pomegranate molasses, pomegranate juice, black pepper, a pinch of salt, and tahini. Remove the onions from the skewer and drizzle the pomegranate molasses mixture. If you are on a weight loss mission, you must watch what you eat. 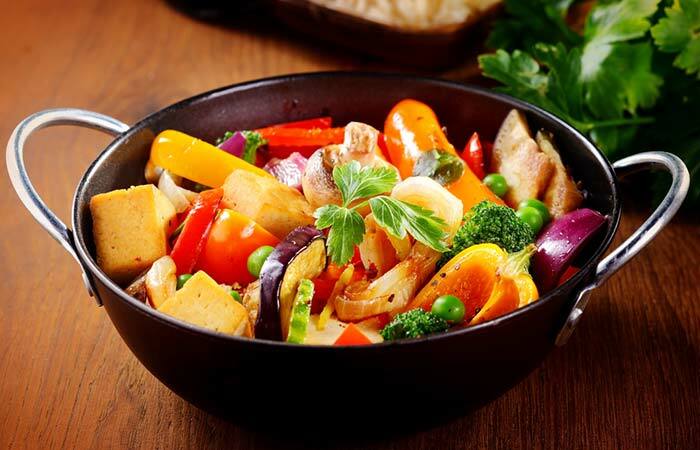 Consume wholesome food and cook it the right way to reap all the goodness of each vegetable. Here’s how to prepare baked onion with veggies for weight loss. How To Prepare Baked Onion, Sweet Potato, Sausage, And Bell Peppers? Heat 2 teaspoons olive oil in a skillet and cook the sausages until they turn brown. Now, add all the veggies to a baking dish and drizzle a generous amount of olive oil. Add the chicken stock and season it with salt, pepper, and dried rosemary. Add the cooked sausage and bake it for 25-30 minutes. This yummy dish is full of flavor and is great for weight loss. It is loaded with antioxidants and dietary fiber, which will help prevent fat absorption and improve bowel movement. Here’s how to prepare it. Heat olive oil in a frying pan and saute the onions. Now add the zucchini, salt, pepper, teriyaki sauce, and soy sauce. 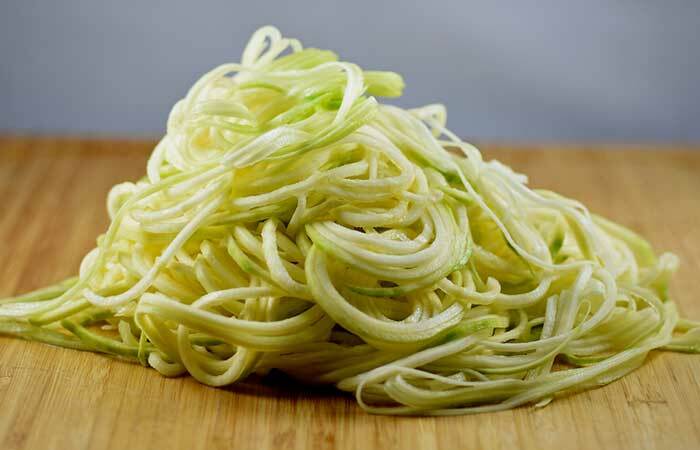 Cook it until the zucchini becomes soft and cooked. Check if salt is required and add some if needed. Transfer it to a plate and garnish with sesame seeds. Salads are one of the best things you can have when you want to lose weight. They don’t weigh you down, keep your metabolism active, supports digestion, and accelerates fat mobilization. So, here’s a delicious onion salad recipe for you to try. How To Prepare Caramelized Onion And Red Chard Salad? Add olive oil, lime juice, brown sugar, chili flakes, and a pinch of salt in a bowl and mix well. 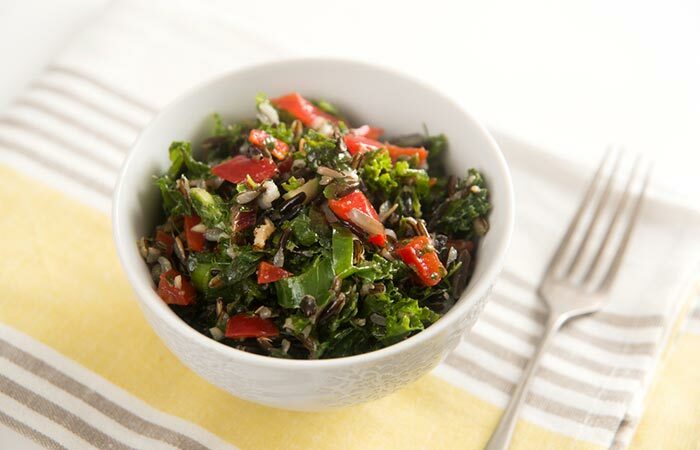 Add onions, red chard, pickled olives, and sun-dried tomatoes in a large bowl. These 4 onion recipes will help keep your hunger at bay and will aid weight loss. You can also try creating your own recipe to fill your tummy and satiate your taste buds. Now, let’s find out how onions help in weight loss. The main causes of the extra weight gain are a sedentary lifestyle; unhealthy eating habits, lack of exercise, hormonal imbalance, medical issues, medications etc. Using onion is a natural way of reducing weight and extra fat from the body. It increases the body’s metabolic rate. The metabolic rate is the rate of digestion of your food and its absorption into the cells. If this rate is affected due to some problems, it can lead to various other diseases. Onions have antioxidants that help prevent oxidative damage, and speed up metabolism. It also has anti-inflammatory properties that prevent inflammation-induced weight gain. Onions have enzymes that help mobilize fat. Finally, onions also prevent insulin resistance and therefore prevent the risk of diabetes. Apart from weight loss, onions are also good for your overall health. Here are the health benefits that onion offers. Prevents inflammation, allergies, and respiratory disorders. Prevents skin and hair problems. Though there are so many health benefits of onions, there are few after effects of eating onions. But these can easily be avoided by following the tips mentioned below. After eating raw onion or a dish that contains too many onions; you may have a pungent odor lingering in your mouth. To get rid of that, chew 2-3 mint leaves or chew a peppermint gum. You can also brush your teeth and use mouthwash to get rid of the onion breath. Sprouted onions are not nutritionally as good as the unsprouted onions. So, buy only unsprouted onions. Light a candle while chopping onions. You can also wear swimming goggles to prevent onion vapors from reaching your eyes. Wash your hands thoroughly and then rub your fingers with the back of a spoon. The smell will go away like magic! Onion good for weight loss because it has antioxidants, vitamins, minerals, and anti-inflammatory properties that help mobilize fat and accelerate metabolic reactions in the body. For weight loss onion juice is highly effective and if you cannot eat raw onion, you can try consuming onion juice for burning fat. Onion soup is good for weight loss. The onion soup recipe includes other veggies along with onion that adds to the nutrition value of onion and therefore is good for weight loss and for improving health. Onion seeds or nigella seeds contain an antioxidant, nigellone that prevents fat accumulation and helps in fat mobilization. Adding onion seeds to food can keep your hunger pangs at bay. 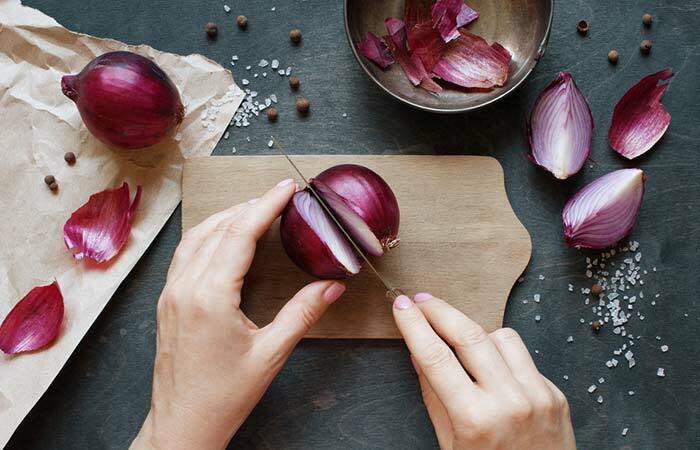 Cooking damages the phytonutrients and therefore consume raw onions to lose weight quickly. Spring onion or green onion stimulates satiety in the brain and is an effective fat burner. You can use spring onion in onion soup to augment the fat burning properties of the onion soup. 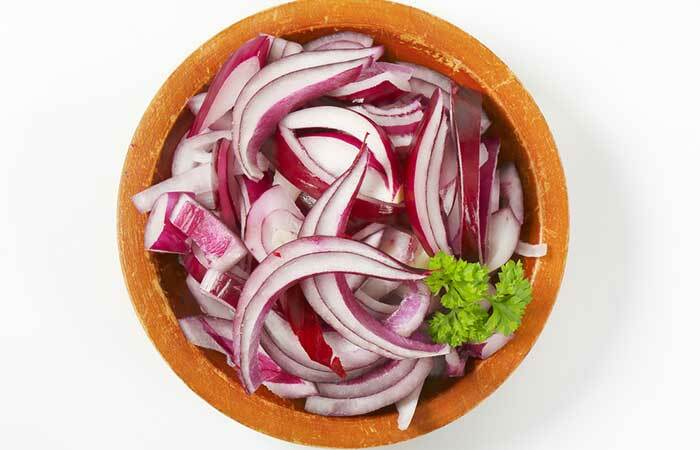 Red onion is good for weight loss. Be cautious while cutting it as the vapor of the red onion is more intense. onions are of great help to you. Start consuming them and follow a healthy lifestyle to lose weight permanently.